I love recipes where I can do all (most of) the prep, chuck it in the oven and just let the oven do the rest. Recipes like this are even better on a Sunday! Everybody had seconds of this. The potato/anchovy combo made creamy deliciousness that partnered so well with roast lamb. 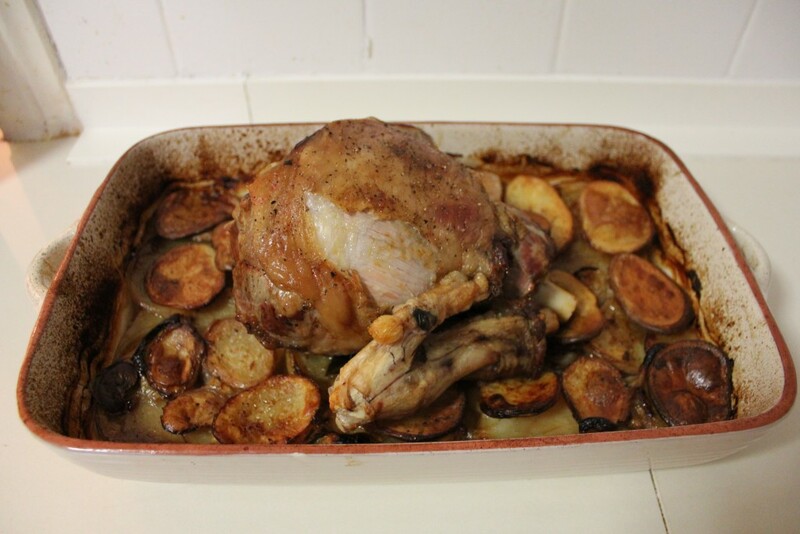 The only thing I would change is my rotation of the lamb for the photo… but I was in such a hurry for Stu to carve it! Preheat your oven to 200 degrees celsius and lightly grease a large baking dish with olive oil. Slice your potatoes and onion about 4mm thick. Layer the potatoes, onions, garlic, bay leaf and anchovies in the baking dish with salt and pepper. Place the lamb leg on top and pour in the stock until it is about 3/4 up the potato bake. Dot the top with a bit of butter. Or don’t! Place the dish in the oven for 20 minutes. Reduce the heat to 180 and cook for a further 40 minutes or until the lamb is cooked to your liking. When cooked, put the lamb aside on a plate covered in foil to rest. Turn the oven back up to 200 degrees and cook the potatoes until the stock is almost gone and the top is brown and crispy. This will take 20-30 minutes. Finely chop the parsley and chilli and stir through a little olive oil to make a nice dressing. Steam greens. Carve the lamb, and serve! I served this with beans and broccolini, but spinach or silver beet would be lovely as well. The chilli and parsley number really cuts through the richness of the meat and potatoes.